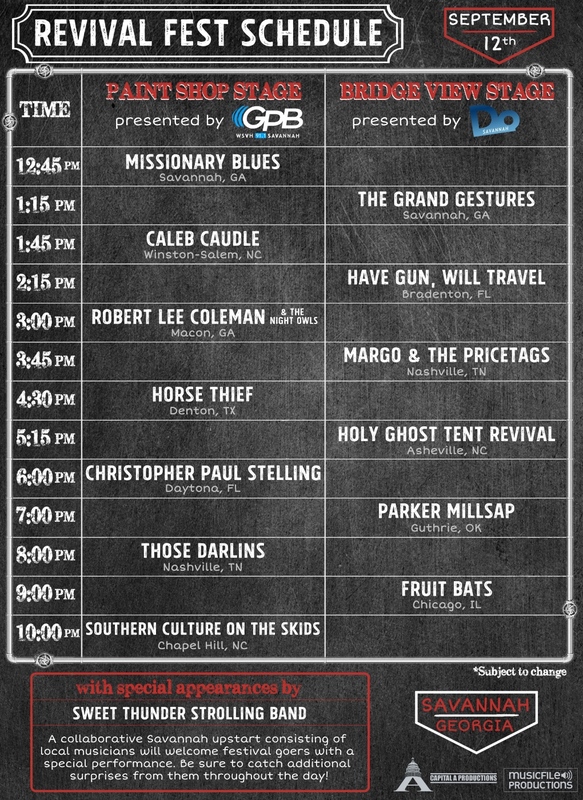 MusicFile Productions released the Revival Fest schedule earlier today. Let’s put it simply: September 12th promises to be one of the best days for live music in Savannah in 2015. Revival Fest takes place on two stages, which are sponsored this year by Do Savannah and GPB Savannah, inside and outside the old railway paint shops on the western edge of the Georgia State Railroad Museum (aka, The Roundhouse). Capital A Productions will be handling sound, lighting, and staging again this year. Revival Fest is the only festival gig that Fruit Bats is scheduled to play since the group recently reformed. Southern Culture on the Skids played a raucous and wild show to kick off the 2015 Savannah Stopover, which is also produced by MusicFile, and there’s every reason to expect another exciting set. Those Darlins has embraced a kind of alt-country that feel both intensely “alt” and solidly “country” — no mean feat. Parker Millsap might be the best folk and blues performer that you’ve never heard of. Missionary Blues and The Grand Gestures are both excellent local choices for the lineup. The Revival Fest gates open at noon with a performance by the Savannah-based Sweet Thunder Strolling Band, which, like the last two years, will be performing throughout the day between stage sets. The Revival Fest Marketplace, which is sponsored by Creative Approach, will include a variety of vendors, including Barnes XPress Mobile Kitchen, Leopold’s Ice Cream, 13 Bricks Clothing, Art Rise Savannah, WellFED Savannah, Kleo’s Handcrafted Soaps, Batey Rehab Project Inc, Duende Ecofriendly Leather, Deep Earth, and Mamie Ruth | M.Liz Studios and Boutique. Click here to see the featured beers and liquors. On Friday, Sept. 11th, from 6 to 9 p.m., there will be a Revival Fest kickoff: Bourbon & Brass On Broughton, which will be hosted by the Savannah Downtown Business Association and Stooges Brass Band from New Orleans.